Make sure the WiPy is connected over serial to Pymakr ( sometimes restarting Pymakr gets things going if it can't detect it). Almost ready to give it a try! Next connect to your WiPy over WIFI and FTP into the /lib folder. I use Fillezilla for this. Upload our renamed library umqtt to the /lib folder on the board. Make sure the WiPy is connected over serial to Pymakr ( again a restart may help this). Then hit the play button to upload your script to the board . You should see the Wifi connected printed in the console, and then the while loop commence. 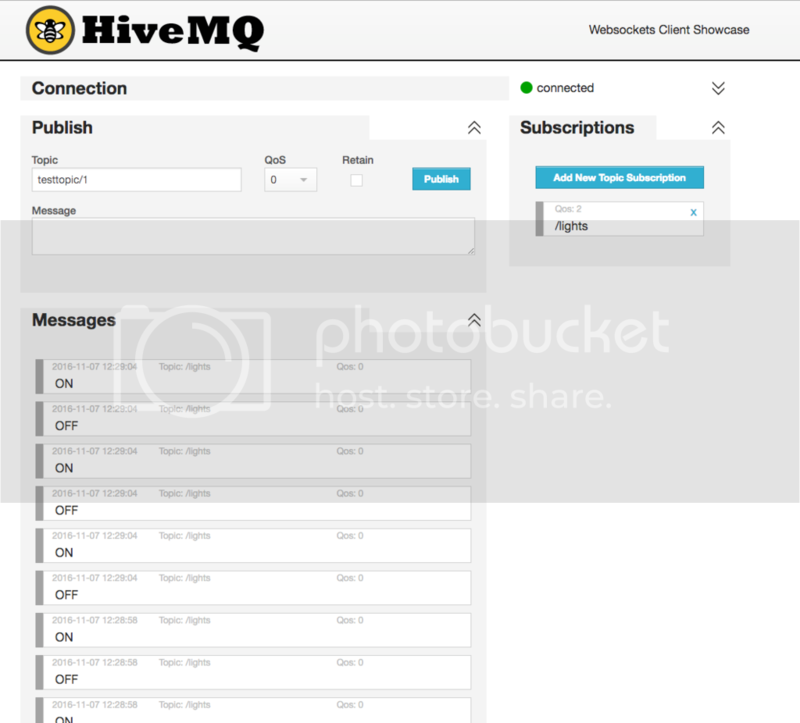 Go back to http://www.hivemq.com/demos/websocket-client/ and subscribe to your topic, and you should see the messages start coming in on the broker. Bit of a dummies guide but hope this helps some people! It's Pymakr Atom Plugin I use. Pymakr IDE or Pymakr Atom Plugin? If First then do not use it. @bucknall yes, I use Pymakr. @achide How are you uploading code to your device? Are you using the Pymakr Plugin? I'm new with pycom. Maybe it's a stupid question, I would like to know how to import umqtt library. I've put it in lib folder of sys.path, but when I import this module, it told me no module named 'umqtt'? It might be work checking out https://youtu.be/3NDPSbr5J14?list=PLS09TA19umCOavPeP_FoMHoCuCzjJUWQk, where I talk about MQTT and how to get set up with it. Currently, the documentation on MQTT that we have online is out of date and I am re-writing it as we speak. I'll post back once it has been published! I'm also using the same apparently current 1.3.2 simple.py file, and having the exact issue described by lcgeldenhuys 3 months ago. Any suggestions on how to get past this? What version of the micropython-umqtt.simple library are you using? I'm trying the latest 1.3.2. It doesn't have the same bug on line 57 anymore, in fact it doesn't seem to use the same timeout mechanism. I can pub / sub using the MQTT.fx client on my laptop, and the WiPy is on the same network (I can ping and ftp to WiPy from laptop). Adjusting the timeout period in simple.py is helping to make the setup work consistent. @RSK , Pretty sure you have a port issue. 1883 should work. For some reason Hive MQ isn't accepting requests on 1883 currently. I will search for another public test broker.. If i try to change in the browser to 1883 then socket connection fails in websocket client. @RSK Have you tried using port 1883 instead of 8000? And the changes done to line number 57 "self.sock.settimeout(self.timeout)"
I have downloaded umqtt.simple.py from https://github.com/micropython/micropython-lib and placed it in /flash/simple.py of the LoPy using FTP. @RSK umqtt is not part of Pycom's firmware or standard micropython. It is an external Python library, so to be able to use it you need to upload it to your device. The easiest way to do that is using Pymakr. Another way is using plain FTP (https://docs.pycom.io/pycom_esp32/pycom_esp32/general.html#local-file-system-and-ftp-access). Please read step 2 again and try to follow the instructions. If you have any problems let us know. MQTTClient is missing in the latest firmware, using the image release on 02/Dec/2016. @gas It's working now. The used port was wrong. Thxs for your help.